"At the end of summer during the Great Depression the excess cucumber crop was sliced, salted, pickled, and put up in jars for the cold, lean months ahead. I can just imagine what a treat it was to fill a sandwich with these sweet crunchy coins (bread and butter pickles, as they came to be known). I'm sure it was a wonderful break from what must have been a fairly flavorless existence. 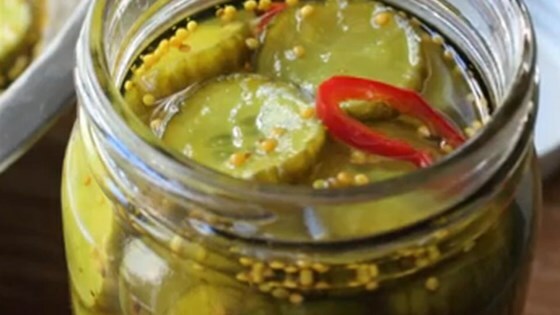 For longer storage, you can process the pickles in canning jars in a boiling water canner." Combine cucumbers, onion, and peppers in a bowl; pour kosher salt over the top and stir to coat completely. Cover the bowl with plastic wrap and refrigerate, stirring occasionally, 2 to 4 hours. Rinse cucumber mixture in a colander under cold water until all salt is washed away, 3 to 4 minutes. Drain. Stir vinegar, sugar, water, garlic, mustard seed, celery seed, peppercorns, turmeric, and ground cloves together in a saucepan; bring to a simmer and cook until brine flavors combine, about 2 minutes. Add cucumber mixture to brine; heat until almost boiling, remove from heat, and cool completely. Transfer to jars and store in the refrigerator. The nutrition data for this recipe includes the full amount of salt. The actual amount of salt consumed will vary. I substituted raw Turbinado sugar for processed granulated sugar, but followed the rest of the recipe 100%. Great pickles, best ever for me. This is definitely a keeper. No changes necessary!! These are so good ,my brother-in-law said I should sell them at our Farmer's Market!! We loved these pickles! I will definitely save this recipe and make them again. I added 1/4 cup more sugar for my taste. This is an excellent recipe that will be the only recipe that I use from now on.